RhythmArty plugin for Rhythmbox lets you browse your music collection via an 'Album Art Display', one of the things that has been missing from Rhythmbox for a long time. I love rhythmbox music player because it is lightweight and it just works. It does not have many fancy features. So, to make my rhythmbox experience more entertaining I decide to write a plugin for album art browsing, called RhythmArty. It search for embedded cover art and in folder cover art. It doesn't download covers from internet. Only embedded cover art and in folder cover art are supported for now. 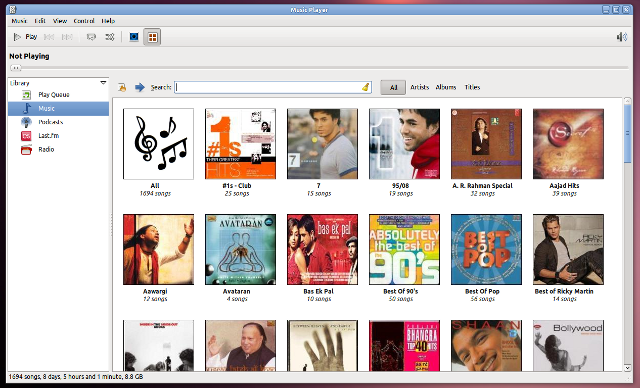 You can browse music via an 'Album Art Display' only or a two pane view that includes artists browser also. To toggle between views, click on the small icon left to the search bar. If you want to fall back to the default display, you can do so by turning off Album Art Display from a button next to the player controls. After installing the deb file, go to Rhythmbox Plugins and enable RhythmArty.